But why? Is it because the subject is so beautiful or the venue is so vibrant or the costuming is so exquisite? Partly, no doubt. But chances are, you’re viewing it through the lens of a tireless media professional, and the pixels in front of you are actually a copyrighted work and a representation of someone’s livelihood or goals. And it is their skill and talent, both technical and emotional, that have transported you to this place. 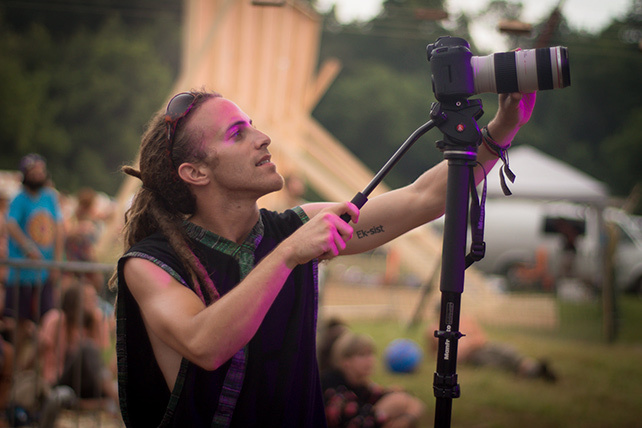 These individuals that comprise the Transformational Festival Media Landscape — photographers and videographers, writers and fine artists, installation and graphic designers, editors, web developers and radio hosts — are among the most hard-working and dedicated professionals at Lucidity and festivals like it. On-site Media never stops working. 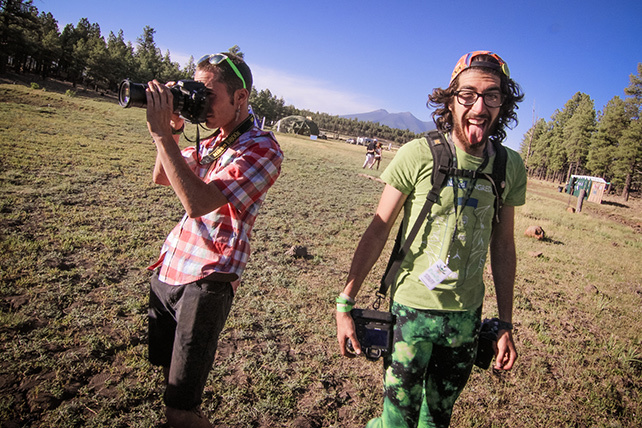 Leaving camp without a camera is torture as you’re always one moment away from missing the shot of a lifetime. Writers are constantly crunching storylines, tracking trends and stepping back into the role of the observer to communicate about experiences larger than themselves. Though many of us “live the life,” traveling from festival-to-festival and getting some free tickets and meals, it’s not as easy as it looks. We buy (often on credit), and maintain expensive gear, running entire businesses from the trunks of our cars. We put tens of thousands of miles on said cars. And we spend dozens, sometimes hundreds of hours processing and developing our projects long after the festivals have pulled down their stages and left only the memory of footprints in the dust. Is it rewarding? Usually. But there’s one type of situation that can happen where all of our work, these labors of love, loses its passion. That’s when someone treats us like less than professionals. We need to be more explicit in our conversations about rights and licensing. We need to put it out there on the table and figure out how to release our creative endeavours in a way that is in alignment with our own personal values as an artist and within the greater cultural shift that we feel today. 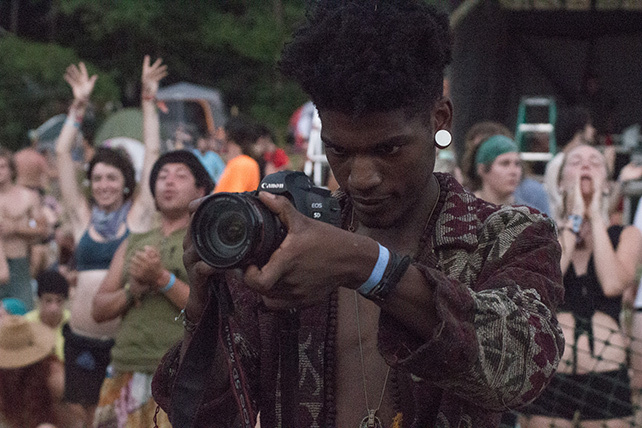 Here at Lucidity, we bill ourselves an open source festival and I would love to see media professionals step up to help create a truly open source media repository of Festival Culture for future generations by utilizing a Creative Commons license that works for you. Creative Commons allows you to “retain copyright while allowing others to copy, distribute, and make some uses of their work.” These terms are for the purpose of enlivening and promoting conscious energy events developed by Lucidity Festival LLC or for like-minded events with which Lucidity Festival LLC is contracted to support. Personally, I release all of my uncontracted photography under a Creative Commons license, though I retain copyright on my writing. I’m not saying this is right for everyone, but I’d love for this conversation to break open in a big way and hear media professionals make clear statements and agreements in their postings and accounts. Someone who’s doing a great job of that is Chuck of The Adventures of Chuck Manley. 2. Credit, Where Credit’s Due. So, what can you do to show that you appreciate these dedicated archivists of our blooming culture? Credit them. Crediting and Licensing go hand-in-hand. Lucidity is actively collecting preferred bylines from our media staff and will always try to over-credit when possible. Though the status of copyright is murky in the digital age, where photos get passed around Tumblr like the last cup at the campsite, the act of linking to the content creator is a major statement of trust, solidarity and appreciation. As Vice said in their recent article (This Is What We’re Talking About When We Talk About Crediting Photographers), removing our names from our work not only denies us our creative power, but it strips us of our opportunity to gain future work, fans, and the recognition required to build a career in festival journalism. Those little bylines that you see around an image? Preserve them if you reshare them. Watermarks? Those aren’t for cropping. Video descriptions should remain in-tact. Re-posting someone’s words without putting them in context and linking to the original article? Stealing. Lucidity doesn’t always get it right, (Thanks for your understanding, David and L’Unkle’s Boink! ), but we’re trying. Part of the challenge is how we manage metadata and image archives (it’s a lot of files). There are so many festivals and events and promoters and artists who are just waltzing all over the copyrights of photographers! Everyone, media professionals or festival attendees should be calling out uncredited photos and copyright rip-offs wherever they pop up. Let’s let it become a meme. Maybe the Gaye family will have brought that back to the mainstream. Photographers are one of a select group of professionals where people expect them to just work “for exposure.” Imagine inviting a plumber over to fix your pipes and to tell him that instead of paying him, you’ll let him into your house and tell all your friends how awesome he is. With so many cameras out there, whether built into cellphones or with an interchangeable lens at the end, the value of an image or a video has diminished over time. We’re inundated with content and the festival media community has not helped to quiet the noise around the signal. Mea culpa. I’m guilty of cutting corners when I’m on an unpaid assignment, spending less time in post, uploading too many 3-star photos because I don’t have the energy to wean them down. I’m resolving to try harder this year to share my best work, to work to make every picture count. But, time is money, and as much as I love pouring over my pixelated memories and choosing the perfect expression out of 20 almost-identical shots, I still have to move on to the next paying project. 4. Stop. Listen and Collaborate. So how will we start improving in this department? Well, having a conversation about it is the first step. Building a guild that represents our interests, or a union that supports our common goals, could be another step. 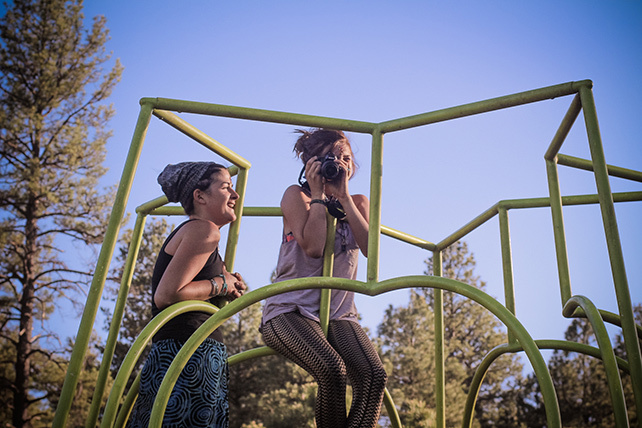 Here, in this space and in others, Lucidity Festival welcomes the hard questions, addresses calls for transparency and stands for the goals and the needs of the collective. We should celebrate and encourage entrepreneurship in the media sphere. For those of us that want to spend a major portion of the year in the festival scene, we must figure out ways to diversify our income streams, to reach out into new audiences and create a brand that is unique to our personal vision. Love and Light with EVeryman at Calling in the South: Lucidity Pre-Party in Los Angeles. 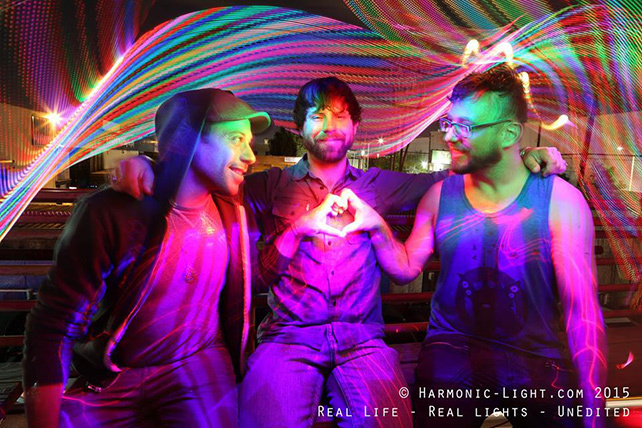 Photo by Harmonic Light. We should figure out appropriate sponsorships within the media sphere. I’d be happy to tattoo T&A Leather’s logo to the back of my leg! I’d be elated to mention that this photo album is brought to you by the Lovin Foods from Lydia’s Lovin Foods, serving delicious meals to you, no matter your gender, creed or color of your activated chakra! In sum, we need to professionalize and tighten up our individual and collective business plans. We need to hold ourselves to the highest standards of editing. And we need to work together to share resources and knowledge to collectively raise the entire body of work. 5. How Can Media Stay Independent When They’re Dependent on Comp Tickets? The fact that media outlets acquire tickets for their writers and photographers in lieu of paying them for work is a serious issue on many levels. In addition to the reasons mentioned above, I wonder: how independent and critical can we expect outlets to be if they are dependent on playing nice so that they can get tickets to future festivals? As it stands, there are very few media organizations in our scene that support writers or photographers with anything beyond tickets. I know from talking to my peers that this is something we’re all working towards. From my multi-hour talks with Saphir Lewis at Festival Fire, to diving into business challenges with the guys at LostinSound, to the folks at Fest300 offering some paid opportunities for writers and photographers, it’s something everyone is trying to figure out. There are two possible business models that currently exist, and both are important to long-term success for a media channel: advertising and subscriptions. Few websites offer the level of content worthy of subscriptions, but it seems to work at sites such as Elephant Journal or Brain Pickings. Part of the problem for advertising is that there are too many channels for what is, all in all, still a niche market. It’s hard to make the case to a potential advertiser that your channel is worthy of them plopping down $500 or $1000 bucks, when it’s just one of so many places vying for attention. If we can’t all pick ONE CHANNEL and put all of our genius into it, then we need to create an advertiser network and collaborate to distribute advertising across multiple streams and communalize revenue based on transparent analytics. Anyone want to take a stab at that? I can say, emphatically, that Lucidity Festival appreciates and engages with well thought out articles that really dig deep into the scene as a whole, or highlight challenges at singular festivals, as long as they aren’t being written as clickbait/knee jerk reactions/vitriol. 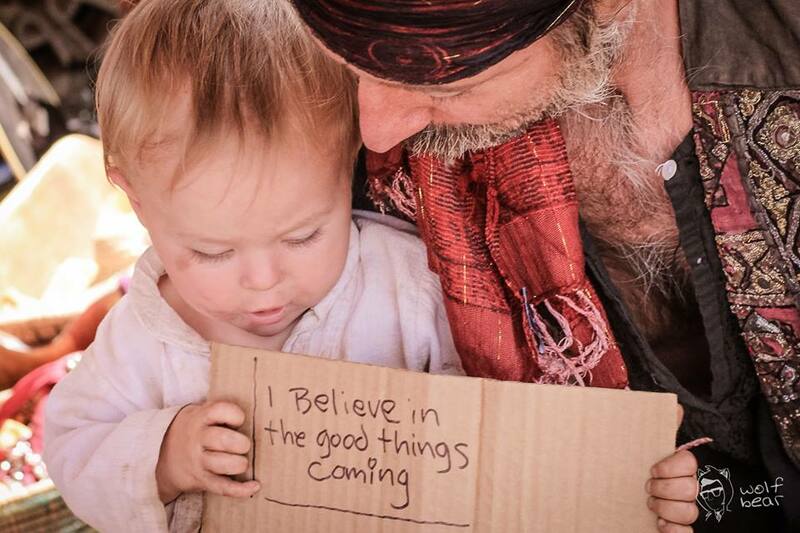 Look through the Lucidity blog and you’ll see dozens of articles that do just that. And I’m calling on the many media outlets that focus on our scene to start writing critically, using the logical mind to identify opportunities for growth, potential pitfalls that could break our momentum and call for honesty, integrity and transparency from festival producers. Let’s use our words and reaffirm the value of saying something worth putting our name next to. If we depend on sharing our emotions with Instagram and Vine, we’re losing the opportunity to break through stigmas and stereotypes by creating mythology around our own real experiences. It will pay off with positive controversy, self-reflection and awareness about who we are as a culture. I remember when, two years ago, concerns about Lucidity’s usage of Totems and Tribal Identity resulted in a long, difficult and ultimately very compelling conversation that has guided our festival into very meaningful relationships. 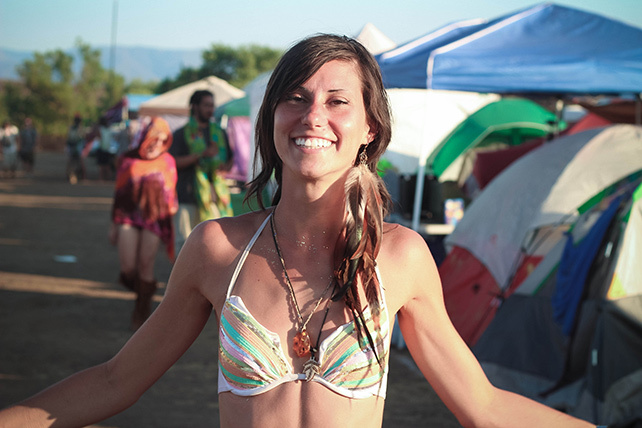 Lucidity Festival walks the line between public and private space. It’s on County property, but it’s a contracted event. You can legally take pictures of people in public (know your rights), but Lucidity, as a private contract, withholds the right to limit certain First Amendment behaviors to uphold sacred space, to help our community feel safe to express their deeper self. Here is a further clarification from our Media FAQ that outlines all of these goals and priorities and expectations. If I’m ever unsure, I ask, “Is It Okay If I Take a Picture Of You?” This is a GREAT question to ask! Consent is numero uno at Lucidity Festival. 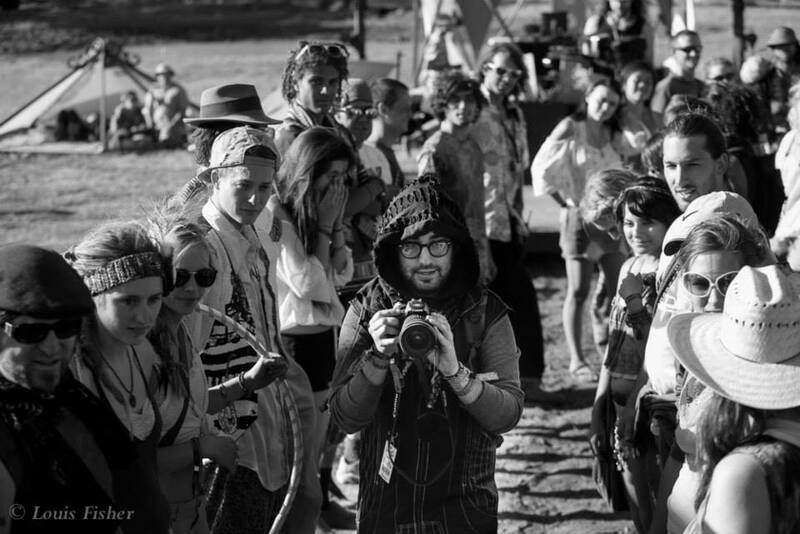 We give our Media relatively free reign across the festival experience to capture unique and meaningful moments from all of the different environments. ASK FIRST is a cardinal rule at Lucidity! If you’re asking yourself whether it’s okay to capture this moment, it sounds like you may have stumbled into a moment where you need to ASK FOR CONSENT. Sometimes, solid eye contact is more than enough. You have your camera pointed from your eye but pull away from the shutter to make sure they see you and acknowledge what you’re doing. Most scheduled events, workshops, parades, etc. are understood to be a very public experience. But consider the careful line between archivist/artist and creeper. Think about why you would possibly need to capture intimate workshops, whether emotional or sexual, yoga classes, attendees in states of undress or physical contact, or pictures of children without their parents’ explicit consent. This conversation is as much for your safety and professional identity as it is for the privacy of our guests. If you’re not sure, ASK. And if you feel like you may have made the wrong decision, apologize and delete it. We understand the desire to capture candid pictures, but consider the consequences of invading the privacy of someone’s very personal moments. Is there another way to get this shot with permission? We ask our media to be an active voice in their art, to not just be a floating camera with no one controlling the shutter. Taking that extra moment to check your surroundings and agreements is a gateway to even more magical pictures. It’s also an opportunity for you to make a deeper connection with your subjects, to offer slight corrections that might improve your shot, to get a little bit more context for your captions or storytelling. If any participant asks you to stop filming, you must stop immediately. If you continue to photograph or film, you face the possibility of being escorted from the event. Thanks for going on this long journey with me about a very small but important part of our community. This is your alternative to “The Mainstream Media,” and I feel like it’s important to understand that we’re all deep in thought about these and many more challenging issues. As Peace Journalists, we have an important role in reshaping and offering alternative story lines to the perceived constant, unbreakable cycle of war and hunger. I know that I feel blessed to be surrounded by so many passionate, talented, well-spoken and careful artists and journalists. The culture of sharing amongst those of us behind the lenses and behind the words is the embodiment of what our scene is trying to do for the world at large. In 40 years, when the world looks around at all of these important ideas that we’re initializing at Lucidity and festivals like it, they won’t know from where they came. If we do our job and we do it well, in Seven Generations, the story will be crystal clear about what we did in 2015 to preserve knowledge and carry on hope and activism for the future of this planet. 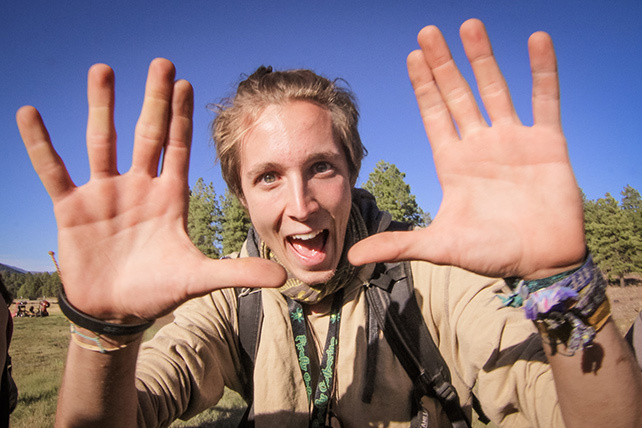 Wesley Wolfbear Pinkham is the Media Wrangler for Lucidity Festival. 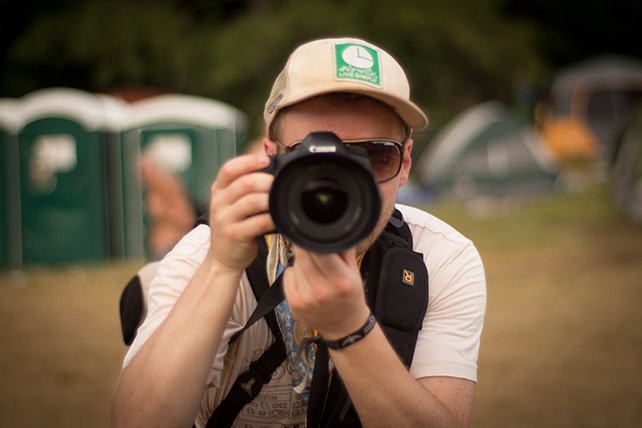 He spent the last two seasons covering 25 festivals over 30,000 miles with The Bloom Series and Lost in Sound. 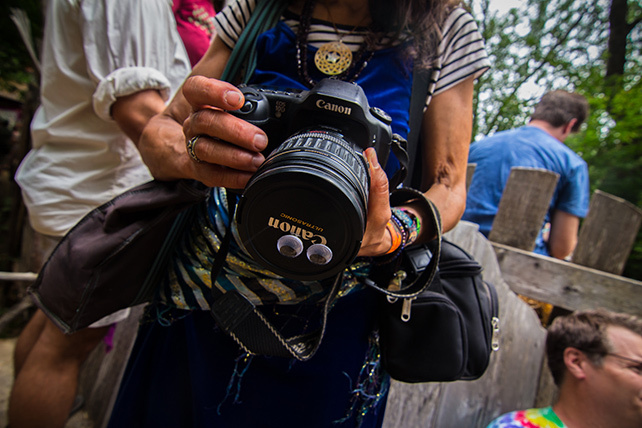 Photo by Louis Fisher at Firefly Gathering near Flagstaff, Arizona. In what ways is a protest TRANSFORMATIVE? It’s a word we’re quickly tiring of, perhaps because transformation is awfully hard to measure. But gathering an empowered voice, to be able to publicly SHOUT DOWN the systems of control that value one’s worth and to see a collective that is capable of creating change in your own life… That is a powerful antidote to disenfranchisement. The next day, things are different. You are not just a cog in the machine. You have a voice. You have an opinion. These things take time. Certainly this is amazing progress in just a couple of years of organizing. They will win, it’s only a question of when. $15/hour minimum wage for all workers to ensure fairness in business. And a Union to make sure that pay stays ahead of welfare wages. 3.6 MILLION fast food workers being paid fair wages will boost the economy. Our country can handle the inflation. If your self-worth is dependent on someone being worth less, you need to check your ego. We spend a lot of time bombarded by images. Advertising, news, graphic t-shirts… There are palpable effects of the mental exhaustion; our brain becomes overwhelmed and desensitized to the images that actually matter. I just gave some of my time over to looking at some of the top photographs of the week from international photojournalists. Death and mourning in Ukraine, the Netherlands, Malaysia, Palestine, Somalia. Afghanistan, Iraq. Lost boys and girls caught in political turmoil along the Rio Grande. The voices of Syria are overcome by newer, sadder faces. Guns, rockets, macho nationalism shrouded in soccer competitions. Then, there’s the occasional light-hearted picture — a festival, a Santa Claus convention, giant sea turtles… Schizophrenic attempts to offer some semblance of we-aren’t-all-fucked. Those of us who criticize the media for its over-emphasis on the negative are being silenced by the actual weight of the new negative. It has been easy to tsk-tsk local news instilling fear over random crime, burglary, drive-by shootings, but the reality of international conflict stands on its own as a much deeper challenge to overcome. A photograph is forever, and the war photographer lives a life on the edge of infinity. A 26 year old photojournalist was killed in the CAR this year. I weep for the dead artist and teller of pixelated truths. Every war-torn image we’re bombarded with connects me deeper with an emerging purpose of soul-driven media. Here in affluent America, with money to spare on exploring the outer limits of our consciousness and abilities, we live in peace and harmony, where death has the potential to be celebrated, not just accepted as a circumstance of existence. If we could replace all these guns and missiles with cameras and guitars, maybe we can make it out alive. This is my tribute to the photojournalists out there on the front lines, and for the photojournalist in all of us. Reach into your pocket and pull out your weapon — iPhone, Samsung, Nokia, Windows, Whatever. So what trigger will you pull?